AJSH & Co New Delhi - Clientele, How to start a business in India? Having been in the industry for seven years now, we have gained a huge amount of expertise and client satisfaction is our top priority. We have a vast and ever-growing clientele spread across various industries. 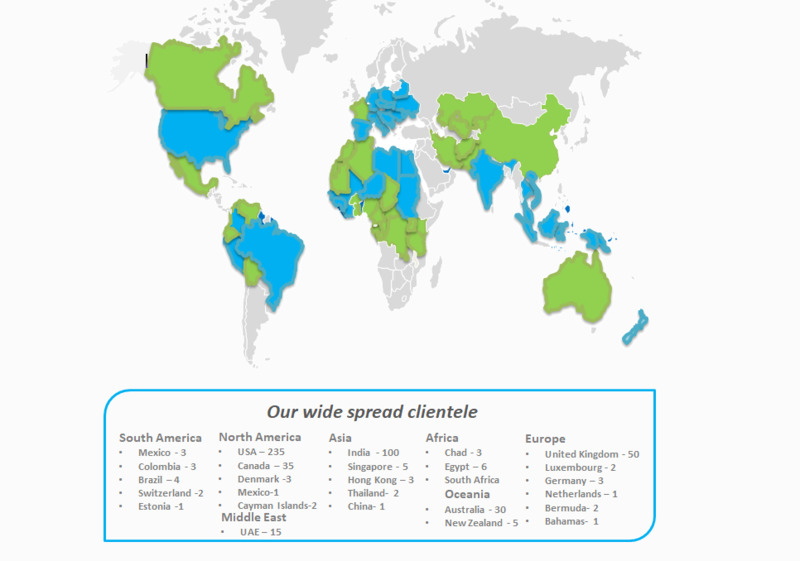 Our client list includes domestic and international entities. As a business taxation firm, we are backed by certain principles, code of conduct, confidentiality and professional ethics. Hence, we ensure that the names and nature of the business organisations is not shared on the website. Australia, Burkina Faso, Canada, Chad, Congo B, China, DRC, France, Finland, Gabon, Ghana, Iran, Italy, Japan, Kenya, Hong Kong, Madagascar, Malawi, Niger, Nigeria, Russia, Sierra Leone, Singapore, Thailand, Tanzania, Uganda, United Arab Emirates, United Kingdom, United States and Zambia.